For three days, the energy level of the 23,000 Catholic teenagers kept soaring. Now their voices, raised in joyous song, filled Lucas Oil Stadium in Indianapolis as wave after wave of nearly 400 bishops, priests, deacons and seminarians processed into the arena. “YC!” the youths thundered in response. “NC!” the archbishop yelled again, raising a fist in the air. “YC!” the youths roared even louder. Seconds later, a spirit of reverence and sacredness descended upon the stadium. No ordinary Mass in a common church building, this was the closing bilingual Mass held on the evening of Nov. 23—the climax of the three-day celebration of Catholic youths and the faith they embrace. 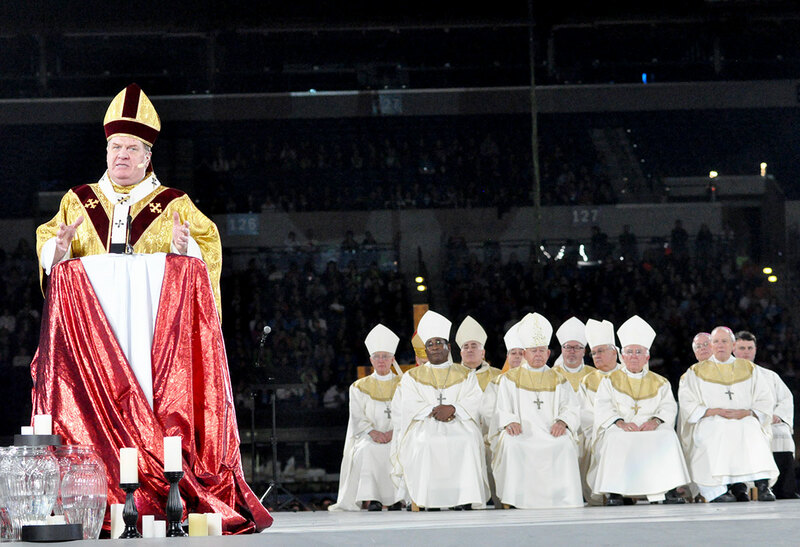 After the Gospel reading, silence pervaded the stadium as the archbishop made his way across the large circular stage in the middle of what is normally the playing field for the Indianapolis Colts. In the presence of 12 bishops, 237 priests, 31 deacons and 90 seminarians—as well as the 23,000 teenagers—Archbishop Tobin offered his homily. Archbishop Tobin commented on two other events that marked the day—the ending of the Year of Faith, and the feast of Christ the King. “Whenever we celebrate the Eucharist, we join our brothers and sisters across time and across space,” he said. “Tonight, in a particular way, we are part of a world parish, a parish that stretches across the globe as 1.2 billion Catholics bring to conclusion a year that was dedicated particularly to our faith. “[Faith is] first and foremost knowing a person, and letting that person know us. That person tonight we call our king, Jesus Christ, the king of the universe, the king of our hearts. “Calling Jesus our king means we belong to him and he belongs to us, but in a way different from any relationship between an earthly king and his subjects. “We belong to the Lord. We are signed, sealed and delivered,” Archbishop Tobin said, calling upon the “Signed. Sealed. Delivered” theme of the conference. He explained to the 23,000 participants that being signed, sealed and delivered means avoiding the extremes of self-centeredness and detachment. Referring to detachment, Archbishop Tobin stated that “we are not people without faces. We are not orphans. We belong to the Lord. “And because we belong to the Lord, the worst thing that could happen to us is not that we die, but that we forget we belong to the Lord. “That’s why we need each other,” the archbishop continued. “To remind each other of the gift of God’s word, the gift of the sacraments and the gift of our community, and to remind us that whether we live or die, we belong to the Lord. In addition to Archbishop Tobin, four other bishops proclaimed parts of the eucharistic prayer—Bishops Christopher J. Coyne, vicar general; Michael D. Pfeifer of San Angelo, Texas; J. Terry Steib of Memphis, Tenn.; and retired Bishop Matthew H. Clark of Rochester, N.Y.
As the words of consecration were spoken, a murmur could be heard from the seats surrounding the altar—the voices of 237 priests joining in the centuries-old prayer. The contrast between the boisterous enthusiasm of the youths during the three days of the conference and their prayerful composure after receiving the Eucharist was dramatic. Neither the knobby, hard plastic tile covering the field nor the solid concrete in the stands prevented the youths from kneeling in reverence. As she prayed, 16-year-old Jordan Frederick of St. Mark the Evangelist Parish in Indianapolis wiped away a tear that traced down her cheek. One of the animators who helped energize the youths during general sessions, Jordan spoke of her tears as a sign of joy and sadness. “I had gotten so close to the other animators,” she said. “We each had our own spiritual journeys [during NCYC], both as individuals and as a group. The event also left a lasting impact on John Washington of the Diocese of Fairbanks, Alaska. Washington is a native Eskimo from a village of 400 people near the Bering Strait. A pandemonium of shouts, laughter, hugs and tears pervaded the stadium as the song continued. Farewell words and embraces were shared as the participants departed, already anticipating the 2015 NCYC to again be held in Indianapolis. In the meantime, experiences shared will be applied, said 16-year-old Hannah Svegal of the Archdiocese of St. Paul and Minneapolis, Minn.
“There were a lot of lessons I learned that opened my eyes to errors in my life that I didn’t even notice I needed to improve in,” said the first-time NCYC participant. “There’s so much higher I could go with my faith that I wasn’t even aware of.